Set over the course of that one night and populated by ghosts of the recently passed and the long dead, Lincoln in the Bardo is a thrilling exploration of death, grief, the powers of good and evil, a novel – in its form and voice – completely unlike anything you have read before. It is also, in the end, an exploration of the deeper meaning and possibilities of life, written as only George Saunders can: with humor, pathos, and grace. It is said that the night Willie Lincoln, who died at the age of 11 of typhoid fever, was laid to rest his father Abraham Lincoln came to the cemetery to visit the body. It is also said that he held his son’s body, spoke to it. 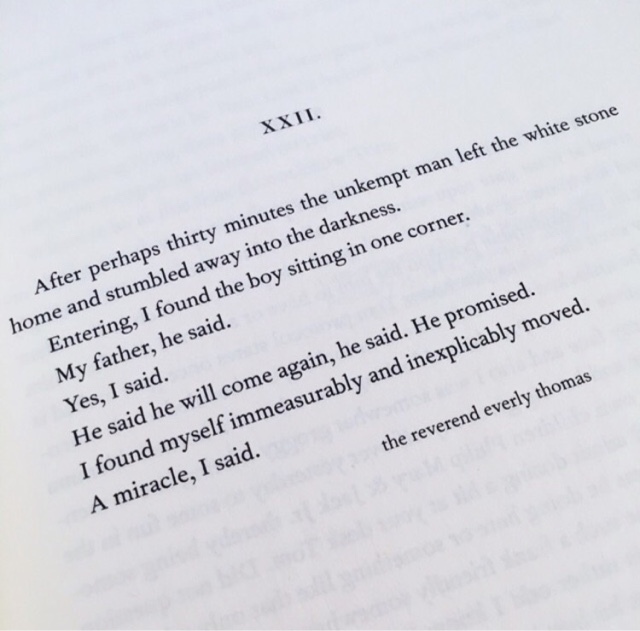 George Saunders has taken this historical nugget and turned it into a masterwork of beauty and pathos. Lincoln in the Bardo is a novel narrated largely by the shades that inhabit the Georgetown cemetery over this single night. These shades are trapped in this limbo, hampered by need, want, and fear. Their forms are grotesquely reshaped by their obsessions and sins, for want of a better word. Willie Lincoln’s shade becomes a focus of attention in the cemetery for children’s souls do not linger in this purgatory. If they do, a horrific fate awaits. Three shades, Vollman (a businessman), Bevins (a printer), and the Reverend Thomas, do their best to encourage Willie’s soul to ascend. But Willie’s father has promised to return and so the little boy waits despite the increasing danger. Lincoln in the Bardo is an incredible first novel from a master of the short fiction format. The shared narration is reminiscent of a Greek chorus or a conversation, rendered on the page like the script of a play. These shades are not Dickens’s ghosts – they are venal, vengeful, lustful, racist, distraught, obsessed with property, old lovers, old slights by family members, old wounds. In a way, they are in collective denial of their state. Saunders reflects the condition of the United States, torn by the Civil War as it reached the height of its bloodiest battles, in the inhabitants of this cemetery. The limbo of Saunders’s Bardo is not the Dantean Limbo of the Inferno, with the virtuous pagans living peacefully throughout eternity; this limbo is menacing, with an undercurrent of evil. It swirls around Willie Lincoln, who waits in vain for his father to take him home. I read this book almost immediately upon receiving the galley direct from George Saunders’s hands. It proceeded to wreck me emotionally for the next 350 pages. The uniqueness of the format allows the characters to speak directly to the reader without any sort of narrative interpretation or point-of-view. I could read this over and over and keep finding little nuggets to wonder over. 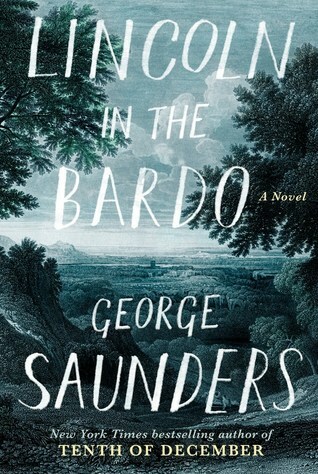 I intend to purchase the audiobook edition of Bardo, which has a star-studded cast of 166 readers including Saunders himself, and just submit to it completely. Lincoln in the Bardo is available on February 14 – you must read it. Dear FTC: I have a signed galley from BEA, which was an absolute highlight of the conference. Thank you so much to Random House and George Saunders for this book. We first met Georgie in his brother Jack’s book, The Soldier’s Scoundrel. Georgie’s line of business is particularly shady, given that he’s a confidence trickster. It can also be deadly when you get cold feet during a deal and back out. Sympathy for a mark is never tolerated. Conveniently, Jack’s partner Oliver has a way to get Georgie out of London while the criminal gang cools off: there’s a “mad” Earl out in Cornwall who needs a secretary (and the local vicar a spy to determine whether the Earl is truly mad). Lawrence Browne, the Earl of Radnor, doesn’t particularly dispute the “mad” appellation. He might well be. He hates to be disturbed by anyone, develops anxiety out in public, and prefers to hole up in his study inventing a method of long-distance communication. Besides which, both his father and his brother were definitely not sane, so it’s only a matter of time before he also loses his grip. He doesn’t need a secretary hanging around, getting into his business, and looking so sinfully handsome. Georgie is quick, efficient, fastidious (the result of a squalid childhood in the slums), and proves himself to be a help to Lawrence in his inventing. He’s also stubborn and reciprocates Lawrence’s desire for pleasure and companionship. But Georgie is living a lie and it’s only a matter of time before his past catches up with him. 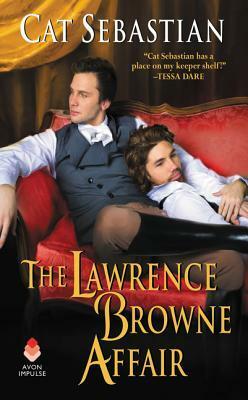 The Lawrence Browne Affair is a sweet romance, but I didn’t love it quite as much as The Soldier’s Scoundrel. Georgie is a very aloof character, even in his own book, so he still feels an enigma to some extent. Because of that, at times the story felt less like a romance and more like “Lawrence found a handler he couldn’t frighten away.” It’s a minor quibble. I did appreciate that Lawrence’s “madness” was not perfectly defined; it comes across as either extreme social anxiety or somewhere on the spectrum but since things like the DSM-V didn’t exist Sebastian tried to stay within contemporary descriptions. There were several interesting turns to the plot I liked. There are some interesting incidents with superstitious Cornish villagers and a surprise character pops up. Plus, we get to see Oliver and Jack in their home, which was so lovely. This is a good second novel and I am intrigued by the character Sebastian has decided to follow in the next book (spoiler: it won’t be Jack and Georgie’s sister, Sarah, nuts). The Lawrence Browne Affair is out now in e-book and will be available in mass market paperback on March 21. Dear FTC: I got a digital galley from the publisher via Edelweiss. And then I bought a copy. 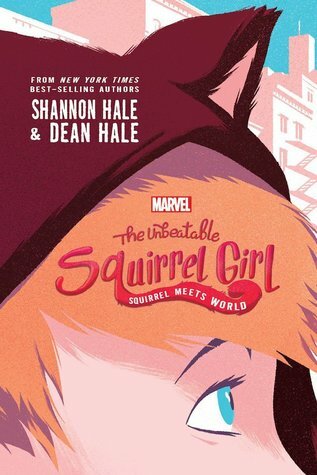 The Unbeatable Squirrel Girl: Squirrel Meets World starts a few years before the opening of the current SG comics run. Fourteen-year-old Doreen’s dad has accepted a new job and the family has moved from California to the New Jersey ‘burbs. Doreen is going to start at a new school, try and make some (human) friends, and keep her bushy squirrel tail hidden in her pants (it gives her a bodacious badonk). That’s all easier said than done. Her neighborhood is filled with strange LARPers and roaming angry dogs, someone is trapping local squirrels in lethal traps, and this “friends” thing isn’t coming along as fast as Doreen hoped (The Somebodies are the mean kids in any school anywhere). When Doreen puts the fear of the Jersey Devil into a pack of local hoodlums, she accidentally becomes a superhero: Squirrel Girl! Who has squirrel friends, like Tippy-Toe! And rescues babies! And winds up in a fight for her neighborhood with the newest super-villain menace: the Micro-Manager! The Hales captured Squirrel Girl’s voice from the comics perfectly (and the footnotes!). They’ve given us a superhero novel that is unbelievably funny with great heart. The narration rotates between Doreen, Tippy-Toe (who has an amazing Jersey Squirrel dialect), and Ana Sophia, Doreen’s new friend who is a computer genius and is obsessed with socks and Thor (possibly in that order). There are several text exchange chapters between Doreen and members of the Avengers that are so funny they should be illegal. The voices were EXACTLY RIGHT and I dare you not to hear the MCU actors’ voices for Black Widow, Tony Stark, and Rocket Racoon when reading those chapters (I almost peed my pants I laughed so hard). Easter Eggs abound for Marvel fans. Go nuts! Even though Squirrel Meets World is aimed at the middle-grade or teen crowd, the book does not condescend or talk down to its audience. It’s a bit like the original Muppets movies – there’s something for everyone. Grown-up fans of SG should enjoy this book, too! The Unbeatable Squirrel Girl: Squirrel Meets World is out TODAY wherever books are sold. Dear FTC: I have a signed galley. Also, I *high-fived* Dean Hale after we talked about which issue of SG is the best, so there’s that. I missed Lee’s first book but I was really intrigued by the flap copy for Pachinko. Fiction is a way for me to identify areas of history or the world I don’t know much about – the history of Korea is definitely a blind spot. Pachinko is the story of Sunja, a poor teenager in 1930s Korea just after the start of the Japanese occupation. When she is seduced and abandoned by a wealthy Korean expatriate, she is left pregnant, a massive source of shame for her hardworking mother. A young Presbyterian minister, Isak, offers to marry Sunja, give her baby a name, and take her with him to his new congregation in Osaka. 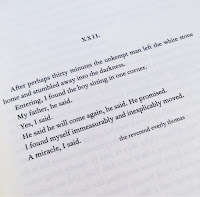 The novel continues to follow Sunja, her sons Noa and Mosazu, her brother-in-law Yosef and his wife Kyunghee, the growing circle of family and friends, and the yakuza Hansu, the man who set the saga in motion, as they survive living as second-class citizens of Japan in the twentieth-century. 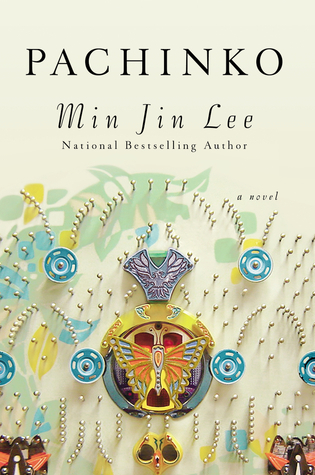 This is a beautifully wrought family novel concentrating on the successes and tragedies of a single Korean family living in Osaka. Lee shows the reader in unflinching detail how poorly Koreans – even those born in Japan – are treated. The Japanese people brutally repressed non-Japanese ethnic minorities and denied Koreans good jobs, equal pay, fair housing, equality under the law, respect, and citizenship (gee, I wonder who else that sounds like…). There is a lot of concern about being one of the “good Koreans” rather than one of the “bad Koreans”. Also very interesting is the almost constant undercurrent of “should we go back to Korea?” Even though life in Japan is hard, with no guarantee of success, there is the constant pull of the homeland as Korea remained divided between North and South against an almost certain belief that none of them would have survived had they stayed in Korea through World War II and the Korean War. Much of the later plot revolves around the economics of the pachinko parlors of Japan. If you don’t know much about pachinko the game, don’t worry. After I read the book, I had to look up how the game worked so I’ll give you the capsule summary. Pachinko seems to be an amalgam of pinball and slots (kind of) and leans more on chance not skill; after the balls are shot into the machine they bounce down from pin to pin, the object being to get them into a small cup to win a payout. So, fate. And life for Sunja and her family in the novel resembles the pachinko balls, bouncing from one pin to another in search of a better life. Pachinko comes out tomorrow, February 7, wherever books are sold. The minute I saw that there was a book set in small town Iowa, by John Darnielle, with some weird Clerks crossed with The Ring plot, was like Give. It. To. Me. Now. I was very disappointed with the big “Iowa” book last year – The Readers of Broken Wheel Recommend – and hoped that the setting for Universal Harvester would ring true. Universal Harvester is set in Nevada, IA – which is an actual town over by Ames in the center of the state – in the late 1990s. Jeremy’s mom died in a car accident when he was a teen, he and his dad are just trying to get through each day, and while working at the Video Hut is fine for now, Jeremy really ought to start looking at getting a job with better potential. The daily Video Hut routine is interrupted one day by a customer complaining about a weird scene inserted into a copy of Targets. Soon another one surfaces in She’s All That. The scenes are crude, black-and-white, in a barn, with creepy breathing and a hooded figure tied to a chair. The scenes are unsettling, disturbing. When Jeremy and his boss Sarah Jane begin investigating how many tapes have inserted “barn scenes”, the rails come off their quiet Iowa lives. 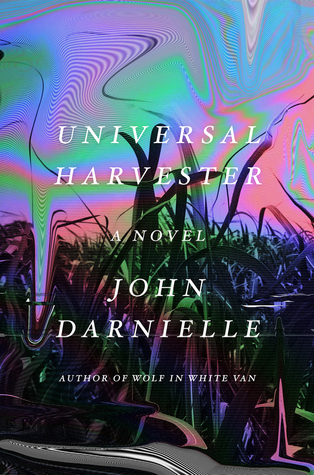 John Darnielle, whose debut novel Wolf in White Van detailed the haunting life of a shut-in running a turn-by-mail RPG after two participants die trying to turn the game into live action, has perfectly captured the rural central Iowa countryside. He gets what it’s like to live here, to drive out into the fields on two-lane blacktop or dirt roads during the growing season when the fields rarely have people in them. How eerie and quiet it is. The deadening of sound. (And if you’re in the dark, how absolutely certain you get that The Children of the Corn might actually be real.) Darnielle also picked up on how Ames was growing out into the surrounding rural area in the 1990s, as did many other large Iowa cities, and how the balance between City and Country changed. Universal Harvester of the strangest books I’ve ever read, but at the very end it all makes sense. The layers of the story twist and change as the characters themselves change and share perspectives during the story. The book’s reality shifts but this isn’t a book with supernatural elements. Right at the point I thought for sure someone was going to turn out to be a demon-possessed ax-murderer Darnielle pointed the story in another direction. An excellent reading experience. Universal Harvester comes out in a few days on Tuesday, February 7! Dear FTC: I received a digital galley from the publisher via NetGalley. 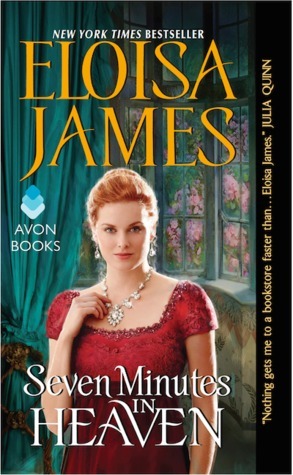 In the course of Eloisa James’s Desperate Duchesses series, she introduced several children who have popped up as protagonists in later books. Thorn (Villiers’s son Tobias) found his match with Lady Xenobia in Three Weeks with Lady X. Now Ward (the scamp Teddy from Desperate Duchesses) has met the one woman who can match wits with both himself and his new-found half-siblings: Lady Eugenia Strange, now the widowed Mrs. Eugenia Snowe (last seen as the brilliant Shakespeare-quoting moppet in Duchess by Night). Ward’s had a very trying year. First, he was falsely arrested and imprisoned by his fiancee’s nefarious uncle to prevent their marriage (don’t worry, Mia found her happily ever after in Four Nights with the Duke). Then, he was presented with his unknown half-siblings Otis and Lizzie when his deceased mother’s theatrical troupe dropped by Oxford. He had to give up his professorship at Oxford due to said false jailing plus half-siblings. And now his harpy of a maternal grandmother, the Duchess of Gilner, is suing for custody of Otis and Lizzie on the basis that Ward is not a suitable guardian because his parents were never married (which is rich, considering that it is her daughter, Lady Lisette, who is the connecting parent and Ward’s father is an earl). Ward is desperate for a Snowe’s governess, those stoic, no-nonsense nannies that are guaranteed to bring hellions in line. Otis and Lizzie are sweet children, but dramatic recitations, Catholic-looking mourning veils, and a velvet-cloak-wearing rat named Jarvis test the nerves of the average governess. Unfortunately, their first Snowe’s governess had an attack of nerves and quit. And their second Snowe’s governess isn’t working out…. Eugenia is a workaholic with a waiting list miles long for her trained governesses. She has no time for a rugged, brilliant, devious male (who for all that he is brilliant and rich he thinks she’s a governess, more fool him) who makes her think of pleasure. He plies her with flattery. He plies her with pastries at Gunther’s because he has deduced she has a sweet tooth that she keeps ruthlessly restrained. He kidnaps her (it’s not bad, don’t worry) with the help of Eugenia’s assistant who has been pushing Eugenia to both take a vacation and have an affair. So Eugenia agrees to allow herself to be kidnapped, spend a fortnight in Oxford, help Otis and Lizzie become “Society” ready, and be passionately seduced by Ward before moving on with her life. Things don’t turn out as planned… (it’s a romance novel, that always happens). I think, although I might be wrong because I can’t test the opposite idea, that this is a novel that works best if you have read Duchess by Night, Desperate Duchesses, and A Duke of Her Own. 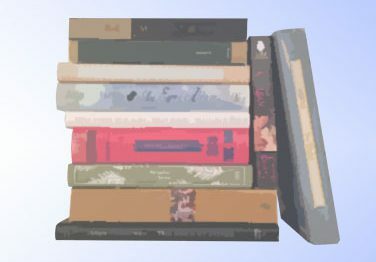 Because even though certain things are explained through out the course of Seven Minutes, there’s a resonant effect that’s missing if you haven’t those three prior books. Eugenia is too rigidly proper in public and Ward too aggressively you-can’t-hurt-me-if-I-don’t-let-you as over-reactions to their childhoods. You don’t get the full spectrum of Lady Lisette unless you read her on the page (and Seven Minutes gives some rather frightening dimensions to Lisette’s behavior in A Duke of Her Own, holy cow). Eugenia’s side of the story was a perhaps a shade too Insta-Lusty for my usual taste, but in this instance it did work for a woman who keeps her sensual side tightly controlled. I loved the appearance of the Duke of Villiers, one of the best heroes (anti-hero? Cupid at times?) ever created; he gives the best advice and gets the best quips. Every one of Eloisa’s Desperate Duchesses couples appears or is mentioned at some point. I loved it. Seven Minutes in Heaven is out now from your favorite bookseller! Dear FTC: I read an advance galley that I won in a giveaway and I also had a copy pre-ordered on my nook.